Tehran (Iran) - Sometimes, it's a bit difficult to believe that Behnam Yakhchali (196-SG-95) is only 23 years old. He's already played in one FIBA Basketball World Cup and two FIBA Asia Cups, before starring for Iran recently throughout the FIBA Basketball World Cup 2019 Asian Qualifiers. The shooting guard is already one of the most recognizable players on the Iran national team and should be the face of the program for years to come. So it comes as a bit of a surprise that basketball wasn't even his first choice of sport. "I used to play soccer when I was a kid," Yakhchali explains. "At that time my younger brother played basketball. I went to one of his practice sessions and everything started from there." "The love of the game started to grow on me and I gave up soccer to follow my love for the game of basketball." We'll never know how good of a soccer player Yakhchali would have turned out to be had he continue down that path. What we do know is that he has turned to be a pretty good player on the hardwood. The 1.91M (6'3') sharpshooter was one of Iran's top scorer's at the 2013 FIBA U19 World Cup and he's been a staple on the senior's national team ever since. At the FIBA Asia Cup 2017, Yakhchali torched the opposition with 57.9 percent shooting from beyond the arc. He led the entire tournament in three-point shots made (22) and averaged 16.0 points, 4.3 rebounds, and 2.8 assists for the bronze medalists. Yakhchali has had a vast amount of success wherever he plays, and it all stems down to his mentality and desire to be a winner. "Whether I play for my club or the national team, all I think about is winning the game," Yakhchali says. "That gives me the motivation and energy to play as hard as I can every time I step on the court." You'd be hard-pressed to name a better shooting guard in Asia in the same age range. Yakhchali is a deadly shooter and a smooth finisher, but can also play tenacious defense with quick hands and quick feet. He claims that he's a product of mixing up a little bit of everything and it's made him one of the better two-guards in the region. "I watch all the great players at different levels," says Yakhchali. "Whether it's in NBA, Europe, or other countries including Iran. I try to learn from them all the good things they do on the court, on the bench, and even off the court." Through observation and a mindset to consistently improve, Yakhchali has become a solid two-way guard for Iran. "I always try to work on my game to get better and improve each and everyday," Yakchali says. "I can't really tell what's my strength but I really feel it every time I take an outside jumper. Most of the coaches I have played for had me stopping the other team's best players, so maybe you can get something from that, too." Yakhchali is already one of the most important pieces of the Iran national team. At the FIBA World Cup Asian Qualifiers, he led the team in scoring and minutes played with 14.8 points in 33.7 minutes per game. More importantly, it's means another FIBA World Cup appearance for the national team and hopefully for Yakhchali as well. 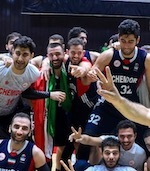 "It's been a great year for me especially after qualifying for the World Cup and hopefully there we can show the quality of Iran basketball," says Yakhchali. Right after the World Cup, Iran will be right back into action at the FIBA Asia Cup 2021 Qualifiers later in the year. In his first two times playing in the FIBA Asia Cup, Yakchali has already laid claims on a silver and a bronze medal with Iran. There's no doubt that he and the national team will be aiming for gold in the upcoming 2021 edition should they go through the qualifying phase.